This dish is great because it can be served at anytime of the year. The Arborio rice is warm, chewy, and hearty, combined with fresh and healthy ingredients making this risotto delicious. The directions may look labor intensive by just reading through this recipe, it's really not. This recipe is easy, and full of flavor, one of my favorites for sure. Bring the broth to a simmer in a medium saucepan. Heat the oil in a heavy saucepan over moderately low heat and cook the onion, stirring occasionally, until soft and a little caramelized , 3 to 5 minutes. Add the rice and cook, stirring constantly, 1 minute. Add wine and simmer, stirring constantly, until absorbed, about 1 minute. Add 3/4 cup of the hot broth, the salt and a few grinds of fresh pepper and simmer, stirring constantly, until broth is absorbed. Continue simmering and adding hot broth, about 3/4 cup at a time, stirring constantly and allowing the broth to be absorbed before adding more, until rice is almost tender and creamy-looking, about 18 minutes. Add the spinach and peas and cook until the spinach is wilted. Add the asparagus and cook just until the vegetables are hot. Stir in the Parmesan and more broth if the risotto seems too thick. Serve in soup plates. 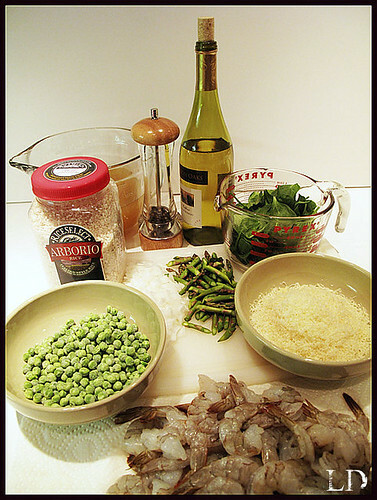 Just before risotto is finished rinse defrosted shrimp. Take shell off but leave tail on ( I just think it makes the shrimp look prettier) :) Pat dry shrimp with paper towel, try to get the shrimp as dry as you can. On a cookie sheet toss shrimp with one tablespoon of olive oil and season generously with Crazy Salt and Old Bay seasoning. Place in oven on broil. Broil shrimp until pink, no longer. 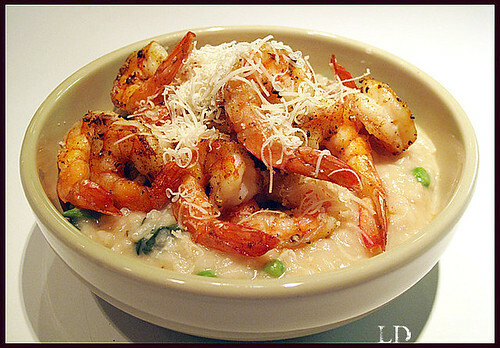 Serve with risotto! This looks and sounds really good, yum! This looks absolutely scrumptious ... can't wait to try it. Wow! Can I come live at your house!! Everything I've seen on here looks absolutely delicious :0) Now only to try them out!! Sure would be the Top Ramen we had for dinner last night!! hahahah!